NASA managers have created an evaluation and roadmap for a potential human mission to visit the 1999 AO10 Near Earth Object (NEO) as early as 2025, as part of their options under the Flexible Path approach to the future of Human Space Flight. The mission would focus on using the International Space Station (ISS) as a testbed, with the ultimate focus on eventually heading to Mars. The journey to an asteroid was originally classed as a potential stop-gap option between the end of the ISS’ active role and the eventual return to the moon, homing NASA’s skills in relearning human space travel out of Low Earth Orbit (LEO). However, the internal 65 page Flexible Path presentation – available on L2 – presented several possible directions NASA may take under the Augustine Commission’s Flexible Path option, including the outlining of a NEO mission in the mid-2020s, a full five to six years after the original target date to return to the moon, as outlined in the Vision of Space Exploration (VSE) – which is no longer seen as achievable. As with the option of setting up a number of large telescopes in LEO, Geostationary Orbit (GEO) and at the LaGrange points, joint missions between robotic and human missions highlight the NEO approach. In the opening statements, the NASA authors decided to make references to the threat such NEOs pose – along with the fact a large amount of NEOs remain undiscovered – as an emphasis on supporting of such a mission. “The first asteroid discovered was Ceres in 1801 by Giuseppe Piazz. 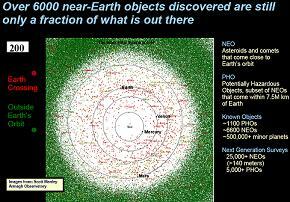 By 1900, hundreds of asteroids were known, including the first NEO – Eros (signified by the red dot) discovered in 1898 by Carl Gustav Witt,” opened the section on the potential NEO mission. “By 1950, ~2,000 asteroids had been discovered, including a number of ‘Earth crossers’ or NEOs. By 1990, >9,000 objects had been identified throughout the inner solar system. Within the decade a total of 86,000 objects had been cataloged. These targets have been generated from a list of NEOs already identified as accessible by human missions lasting up to a year, along with the viable outbound transit time for typical robotic missions to the same targets – resulting in multiple opportunities for human missions, and multiple opportunities also for precursor robotic missions in earlier years. The scenario that was chosen for the purpose of the proposal to visit a NEO, targets the NEO “1999 AO10” – which holds three human launch opportunities in 2025, 2026 and 2032 – with three robotic precursor opportunities in 2019, 2020, or 2021. “A robust example program can be constructed in which a human mission scheduled for launch in 2025 could withstand a one-year launch slip, while being preceded by a robotic reconnaissance precursor mission launched in 2019 that itself could withstand a one- or two-year launch slip,” added the presentation. In NASA’s outline of the mission requirements, this target – and likely the case for other NEOs – would require the automated vehicle to arrive at the asteroid several years prior to the human expedition. Such a robotic mission wouldn’t pose a problem for NASA engineers, who would follow a roadmap laid by the Hayabusa robotic mission, led by the Japan Aerospace Exploration Agency (JAXA) to return a sample of material from a small near-Earth asteroid named 25143 Itokawa. Although not mentioned by name, one of the slides shows the robotic mission would be launched on either an Atlas V Heavy, and/or a Delta IV-Heavy, potentially in three modular stages, prior to rendezvous and docking in LEO ahead to the journey to the asteroid. “Prior to sending a piloted mission to a NEO, additional characterization of the target is required. 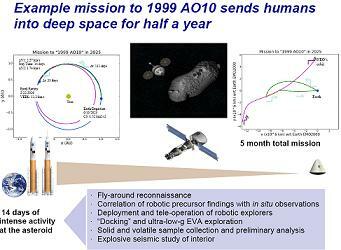 A typical robotic precursor would arrive at the designated NEO ~3 to 5 years prior to the corresponding human mission. This might be a Clementine/Hayabusa-class or Discovery class mission,” noted the presentation. “Mission objectives could include: Basic reconnaissance to assess potential hazards that may pose a risk to both vehicle and crew (as did Ranger, Lunar Orbiter, and Surveyor for Apollo), such as binary or ternary systems, rapid rotators, potentially active surfaces, etc. ; and non-benign surface morphologies. The robotic vehicle would also carry out the role of a guide and companion for the human mission, as depicted in a concept video (available on L2 – see slide) that shows Orion with the robotic vehicle in close attendance. “Aid in the navigation of the piloted vehicle mission to the target NEO; provide additional data coverage during operations, obtain images of interactions of the crew and other assets at the NEO, supplemental examination of the NEO with additional sensors,” added the presentation on the role of the robotic vehicle prior, during and after the human mission. “Monitor the NEO over time after crew and Orion vehicle depart; measure momentum transfer from kinetic/explosive experiment; image crater excavation processes/results (internal composition and structure); provide precise orbital measurements over a relatively long time period (e.g., better understand Yarkovsky and YORP effects). For the scenario used by the Flexible Path presentation, a five to six month long duration flight is installed into the roadmap for the human expedition to the asteroid, and importantly is classed as a vital element of the overall mission – countering claims that robotics can carry out all the requirements of the mission on their own. 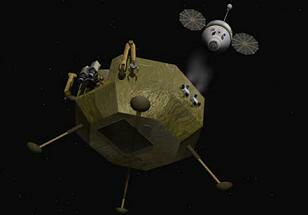 “A robotic precursor would have been conducted ~4 years prior to a human NEO mission. A typical piloted “sprint” mission would be ~155 days in duration,” continued the presentation. “Instruments would include teleoperated rovers or hoppers (multiple trips to/from surface); multi-wavelength radar system (HGA could be used to perform radar tomography of the NEO to obtain internal structure); and small instrument packages for precision deployment by the crew during EVA or with a robotic rover system. Again, the vehicles used in the presentation to transport the crew provides an interesting insight into NASA’s findings – following the Augustine Review – with no sign of Ares I being involved with the human transportation. Instead, a Human Rated Ares V is shown in the slide that illustrates the human launch element of the mission. The mission scenario also provides further information of the roles for the crew once they arrive at the asteroid, noting a 14 day mission at the site, involving numerous EVAs to its surface. “Mission objectives would include: Sample return: several macroscopic samples (10s to 100s of kg) from the surface, collected in geological context in different locations via multiple EVAs; supplemental robotic collection enhances sample return; collection of different or unusual samples from the surface (e.g., white rocks and black boulders on Itokawa),” added the presentation. “Investigation of NEO interior characteristics; determination of internal structure (size scale and distribution of components); measurement of density and macroporosity of the NEO. Attachment of payloads to the surface for operation and subsequent retrieval. 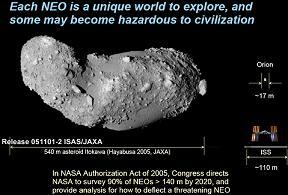 The NEO will have a microgravity regime, and possibly be a rubble pile with high porosity. The presentation continued by selling the viability of such a mission to a NEO, including references to the role the ISS could play in the planning stages, by utilizing the Station as a “first mission step” for a Deep Space Habitat simulation of the human missions. 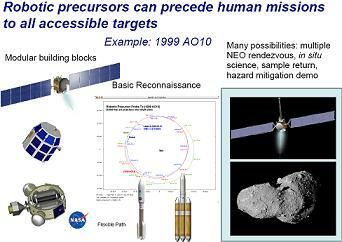 “Exploration of NEOs can be decomposed into a series of logical steps that increment our knowledge of the object population, characterization of their diversity, in situ analysis via robotic missions, and culminate in human visits to one or more objects known by then to be worthy targets,” the presentation claimed. The NASA authors also make claims that these learning experiences would provide vital knowledge ahead of a Mars mission, which would follow a similar robotic to human roadmap. “All human-mission NEO target candidates identified so far offer opportunities for robotic precursor visits while the human flight capabilities are being developed. Such early small-body investigations could include a NEO environment pathfinder, site characterization with sample science and sample return, and data collection to enhance NEO modeling. “Next would come a human system precursor flight, which via vehicle system performance testing would demonstrate deepspace and autonomous operations, automated rendezvous and docking, high bandwidth communications, radiation hardened avionics, relevant-environment reliability, and other key capabilities. In a Flexible Path program, many of these needs could be demonstrated on human missions for other purposes. In conclusion, the NASA authors are positive such a NEO mission is possible and more so viable. Although no dollar amounts are mentioned, the presentation claims this option would be less expensive than either a moon or Mars mission. “They have the ‘lowest price of entry’ of any human exploration missions to natural bodies. 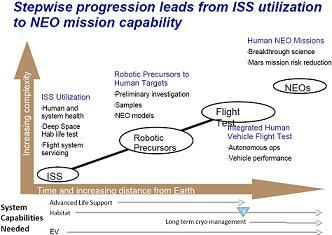 Trip times range from a few months up to Mars-class, and thus can drive development and qualification of long-lived, deep-space human systems and propulsion. Yet they do not require landers, ascent vehicles, or full-up roving mobility systems or surface infrastructure. Part 4 of the Flexible Path Presentation articles will focus on NASA’s Mars and Phobos mission proposals, which have undergone a serious realignment following the Augustine Commission findings.